Baby boomers are still asking ‘What can I do for my country (and my world)?’ and the answer is, probably a lot more than they could when they were twenty. Peace Corps and Bonnie Lee Black have something in common: age. Peace Corps celebrated its 51st anniversary in March this year; Bonnie was 51 when she closed her catering business and joined them as a volunteer in the thickly rain forested interior of Gabon, Central Africa. That was back in 1996. Bonnie was then on the leading edge of a surprising shift in volunteering, not only within Peace Corps, but in many volunteer sending organizations as Baby Boomers eschew outdated stereotypes about aging and throw themselves into post-retirement full-time volunteer service. Even though overall rates of volunteering continue to fall for the Baby Boomers as they age (a normal part of the volunteer life-cycle that I’ve blogged about before), there is an absolute increase in older Americans volunteering abroad. A whole cottage industry has sprung up to cater to short-term senior volunteers abroad. (see here and here and here!) 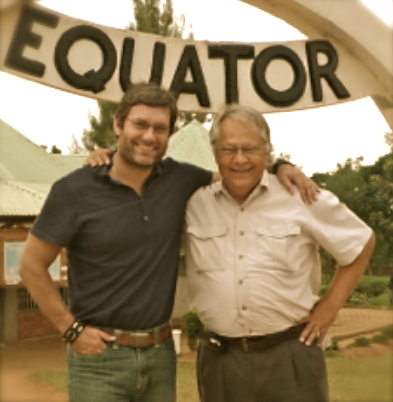 Higher end voluntourism operators owe a good part of their growth and success to these aging adventurer volunteers. (Of course, there are also growing domestic volunteer programs like Senior Corps aimed at connecting older volunteers to worthy causes.) In many ways this is not surprising; Baby Boomers have more money, time, and health to travel abroad then previous aging generations; they are mindful about giving back and leaving a legacy; and they are educated and armed with a range of applicable skills that many younger volunteers simply don’t have. And this last point may be the most important one in terms of changing what volunteer service can look like. 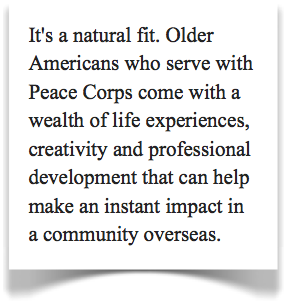 I forgot to share this link to Peace Corps 50+ Volunteers site, a special portal into Peace Corps for older volunteers. Very relevant article Aaron. Living (as a boomer) in SW Florida I can attest to the fact that there are a lot of seniors in this area with more than adequate resources to volunteer and bring significant experience to international volunteerism. Most are also interested in travel so that is an added incentive. I think this is a very significant, untapped resource. There needs to be some marketing of opportunities and needs in South Florida. I think there would be an amazing, effective response. 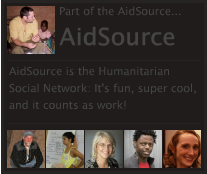 As a self-proclaimed aid elitist, this is, of course, great news. Send me an old codger with experience over a greenhorn any day. However, it should be noted that “experience” can be narrow-minded as well, and that aid professionals are not just professionals that work overseas. Even senior Peace Corp volunteers will need to check their perceptions at the boarding gate.